Diesel-electric submarines, which were also known as ‘conventional’ submarines, played a significant role in the Cold War from the very start. When NATO became operational in the early 1950s the Soviet surface fleet was generally considered to be of minor importance, since it had achieved little of strategic significance during the Second World War and by the late 1940s most of its ships were obsolescent, if not obsolete. The Soviets were outnumbered in every category, and had no ships at all to match the West’s aircraft carriers and amphibious shipping. There was, however, one area in which they were believed to pose a significant threat: that of attack by diesel-electric submarines on Allied sea lines of communication across the Atlantic. With the memories of the German U-boat attacks in the north Atlantic still fresh, this perceived Soviet threat became one of the driving influences in NATO fleet development and deployment throughout the Cold War. Fortunately for the Allies, the revolutionary new German submarines, the ocean-going Type XXI and the coastal Type XXIII, were only just entering service as the war ended, but there was no doubt as to their excellence. Both were real submarines, whose natural habitat was below the surface and which surfaced only when forced to do so. Compared with its predecessors, the Type XXI had a stronger and much more streamlined hull, a larger battery and new control systems which enabled it to fight underwater, and its snorkel tube enabled it to recharge its batteries while remaining submerged. Its underwater speed of 17 knots made it faster than most contemporary ASW ships, especially when there was bad weather on the surface. The Type XXIII was a smaller, coastal equivalent; it too was fast and capable, although its value was limited by its ability to carry only two torpedoes. At the war’s end, the victorious Allies shared forty U-boats between them, with top priority being given to the Types XXI and XXIII; they then scuttled the rest. On receipt of these prizes, only the French and the Soviets put a few Type XXIs into service, while the Americans and British, after very careful examination and trials, used the design innovations, first to adapt their existing submarines, of which both had very large numbers, and subsequently as the basis for new designs. Soviet submarines were supplemented in 1945–6 by a number of ex-German submarines. Twenty Type XXIs were found incomplete when the Red Army captured Danzig, and it was assumed by Western intelligence that these were completed and pressed into Soviet service. With the knowledge available at the time, this was a reasonable conclusion, but it has since come to light that they were scrapped, still incomplete, in 1948–9. In addition, four serviceable Type XXIs and one Type XXIII (plus four Type VIIc and one Type IXC) were handed over to the Soviet navy in 1945–6 from the stock of captured U-boats administered by the British on behalf of the Allies, and all served in the Baltic Fleet until the mid-1950s. The Soviet navy also received two Italian submarines as part of the peace settlement with Italy. Design of the first post-war submarines began in 1946, and these, based on earlier Soviet designs, entered service in the early 1950s, quickly building up in numbers. The early versions of the two larger classes, Whiskey and Zulu, were armed with deck guns but did not have snorkels. Contemporary Western intelligence assessed that these types were Soviet adaptions of the German Type XXI, but this was incorrect: they were developments of previous Soviet designs, but incorporating a few German ideas. Western intelligence was convinced that the Soviet navy was intent on repeating the German U-boat war on the NATO sea lines of communication across the Atlantic, and the large-scale production programmes for the Whiskey and Zulu classes appeared to reinforce this theory. There was therefore some surprise when the production of both types ceased in 1957–8, and this was thought to be a prelude to production of the first Soviet SSNs, until it was discovered that a new conventional submarine was in production: the Foxtrot class. The Foxtrot design was larger, and was in fact the first Soviet design properly to incorporate all the lessons of the Type XXI. Sixty-two were produced for the Soviet navy, and the type became the workhorse of the fleet, being found in every ocean of the world. A second, and very similar, class, the Romeo, was produced by another design bureau, but presumably the Foxtrot proved the better boat, as production of the Romeo finished with the twenty-first unit. The Romeo was, however, exported and the design and tooling were sold to China, where it was built in large numbers. It was then expected in the West, once again, that the Soviet navy would follow the US lead and build only nuclear-powered submarines in future, but this too proved to be erroneous, and twenty Tango-class boats were built between 1971 and 1982. Displacing 3,900 tonnes, these were the largest diesel-electric submarines to be built during the Cold War and were intended to contribute to the ASW defences for the SSBN bastions. Significantly, although all other Soviet diesel-electric submarines were exported, no Tango-class submarine was ever passed to another navy. Construction of diesel-electric submarines continued with at least twenty-four Granay-class (NATO = ‘Kilo’) boats built from 1979 onwards for the Soviet navy. A very similar but less sophisticated design, the Washavyanka class, was designed for the export market, particularly for Warsaw Pact navies. The Soviet navy also experimented with unconventional, but non-nuclear, air-independent propulsion systems. Thirty Quebec-class boats were built in the 1950s which ran on a Russian-developed ‘Kreislauf’ system, using liquid oxygen, while the German Walter hydrogen-peroxide system was tested in the single Project 617 submarine. Neither type proved successful, but intelligence reports of the existence of the Walter project caused some alarm in the West. Perhaps the greatest significance of the Soviet submarine fleet was that throughout the first twenty years of the Cold War its strength, capabilities and intentions were consistently overestimated by Western intelligence. This was partially due to the imposition of an information blackout by the Soviets themselves, which led to Western naval experts taking the worst-possible view (from the Western aspect) of Soviet capabilities and production, as was their wont. These estimates were reinforced by debriefings of repatriated German prisoners of war and scientists who were abducted to the USSR in 1945 and returned in the 1950s. These men gave reports which were frequently incorrect or exaggerated, or were based on the knowledge of just one element of a large programme. Western intelligence, alarmed by other elements of the Soviet threat, extrapolated from these and all too often came up with conclusions which were widely wrong. The Soviets, of course, did nothing to contradict the Western estimates. The Kilo has six bow torpedo tubes and an advanced sonar installation. Two of the tubes are fitted for launching wire-guided torpedoes. The automated reloading system provides for rapid torpedo firing: The first salvo of six can be launched within two minutes and the second salvo five minutes later. The submarine can carry up to 24 tube launched mines in place of torpedoes. The Project 877MK variant of the Kilo was a quieter submarine, and Project 636 was a greatly improved variant, initially intended only for Soviet service, but made available for export from 1993. The Project 636/Kilo has more powerful electric motors, increasing the underwater speed to 19 knots, while more effective machinery permits slower propeller rotation, significantly lowering noise levels. Also, Project 636 was fitted with the MGK- 400EM digital sonar, which provided improved passive detection of submarine targets. From the outset it was envisioned that Kilo variants would be supplied to Warsaw Pact and other navies, accounting for the non-standard project number and the Russian nickname Varshavyanka (woman from Warsaw). The Krasnoye Sormovo and Sudomekh/Admiralty yards worked together to construct ships for foreign use, most designated 877EKM. Since 1985 the yards have completed 21 submarines specifically for transfer: Algeria (2), China (4), India (10), Iran (3) Poland (1), and Romania (1). Some U. S. reports cited a large number of units being sought by China. 48 However, China’s economic situation, coupled with its submarine construction capability, makes indigenous production-with Russian assistance-more likely. With some modifications, the foreign units are designated 877E and, with features for tropical operation, 877EKM. In all, two dozen Kilos were produced for Russia, the final Kilo for Russian service being launched at Komsomol’sk on 6 October 1993. With another 21 built for foreign customers, the total production of Projects 636/877 was 45 submarines. 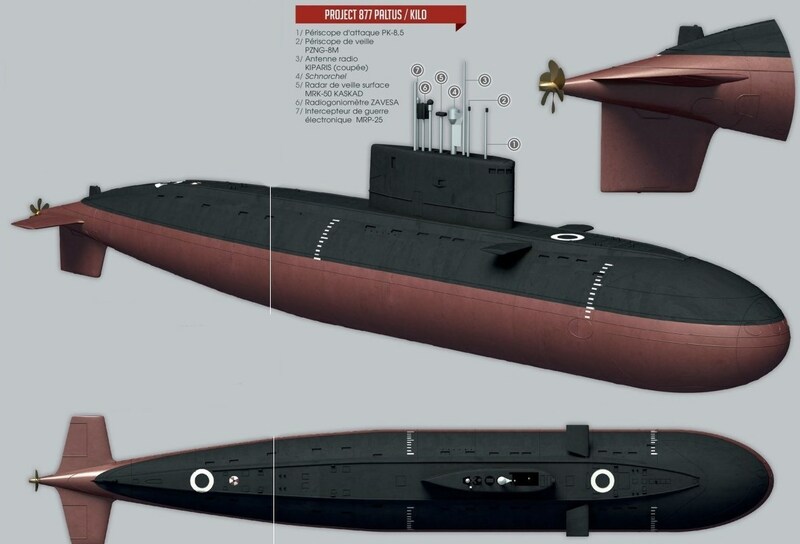 While the Russian submarines can launch both anti-ship and anti-submarine missiles, the foreign variants are armed only with torpedoes, except for the Indian units. Five or six of the Indian Kilos are fitted to fire the 3M-53E Klub-S anti-ship missile, which India also hoped to modify for land attack. The two classes had almost identical layouts. Talking to crew members, it was plain that the Russian boat had similar endurance and performance, but its noise isolation and shock resistance [were] suspect. Also, the larger crew-12 officers, 12 warrant officers, and 33 conscripts-was crammed in with little regard for comfort or ability to rest while off watch. The most obvious shortcoming of the Russian boat was the crude control-room equipment. It relied upon manual operation of all systems, using the remote controls as a backup. Interestingly, the Russian officers dismissed the Upholder class as being too delicate and likely to fail because of over-reliance on automated systems. Still, there may be some mitigation of the views of Commander Powess as the Project 877/Kilo was initially designed for Warsaw Pact navies to operate. This entry was posted in Soviet, Warship by MSW. Bookmark the permalink.